NEW YORK, NY, USA, October 2, 2018 /EINPresswire.com/ — New York Governor Andrew Cuomo signed a lymphedema (LE) patient education bill early this morning. The new law mandates that the New York State Department of Health shall design an informational packet about lymphedema to be given to patients at high risk of developing lymphedema. The bill was authored by the Lymphatic Education & Research Network (LE&RN) and was spearheaded by NYS Assemblymember Linda B. Rosenthal, who sponsored the bill in the New York State Assembly. NYS Senator Martin J. Golden sponsored the bill in the Senate. 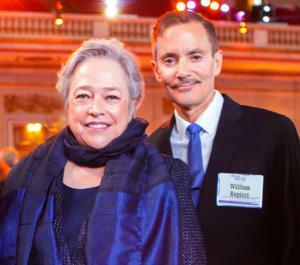 The bill also had a champion and advocate in LE&RN Spokesperson Kathy Bates. According to LE&RN, one of the obstacles to LE becoming a national priority has been its low profile among medical practitioners. With medical schools spending little time on the study of lymphatics, doctors are often slow or unable to diagnose LE. As a result, people at risk for the disease are often caught off-guard by the onset of symptoms and lose valuable time in pursuing a treatment regimen. This pioneering bill is a dramatic step forward for patient education in general and is particularly important to the LE community, in which stories of delayed diagnosis and lack of information are all too common. LE&RN has already begun working with LE&RN Chapters across the nation to ensure that all patients receive the same access to information that is now guaranteed for those in New York State.